PARIS– French banking giant Societe Generale said Tuesday it will cut 1,600 jobs worldwide including around 750 in France, as part of two restructuring plans. The lender said it would revamp its global investment arm and streamline its international retail banking and financial services activities in a bid to ensure "profitable and sustainable growth".The cuts in France would be made "through a voluntary departure plan" while international layoffs would be "in accordance with local regulations and practices," the lender said in a statement. Under the plan, which was presented to French unions on Tuesday, the bank said it will close its "OTC commodities business and its proprietary trading subsidiary". Khalid Bel Hadaoui, a representative of France's CFDT union, told AFP that "each year brings with it a number of job cuts". 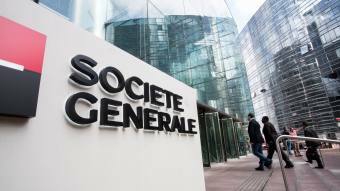 The news had been expected because Societe Generale had already unveiled a plan to reduce costs by around 500 million euros ($560 million) by 2020 to increase the profitability of its market activities. Societe Generale reported higher-than-expected profits in 2018 but said it would adjust its targets and those of its investment bank as it anticipated financial headwinds ahead. The bank has a global workforce of around 148,000.